Atletico Madrid made it back to back clean sheets in all competitions for the first time this season after a convincing 2-0 win over Getafe. ​The hosts headed into the game four places above Atletico after a run of four games without defeat which included three wins, whilst Atletico were without a win in their previous two La Liga encounters, but it was indeed the visitors who took an early lead. A fearsome strike from ​Thomas Lemar from around 35 yards out cannoned off the crossbar and, rather unfortunately for David Soria in the Getafe goal, rebounded off his back and trickled into the goal in what will go down as an own goal - though he wouldn't have known much about it. 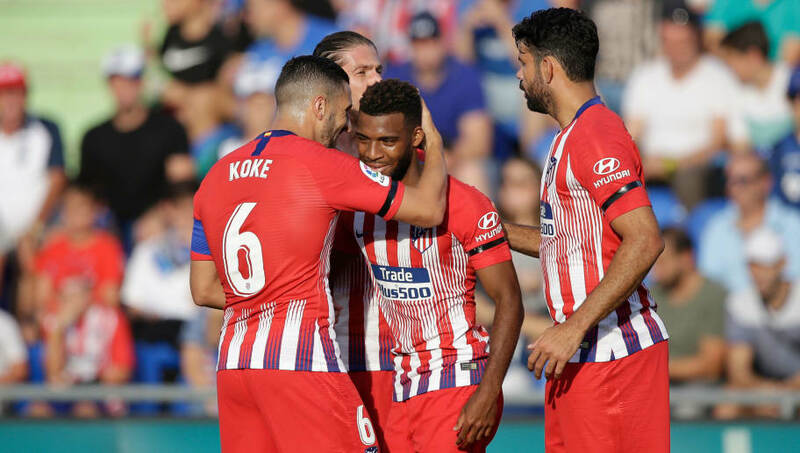 ​Despite going behind, Getafe were edging possession and still creating chances, however on the hour mark Lemar got his goal after a lovely flowing move from ​Atletico. He received the ball from Koke and rounded the keeper before tucking the ball home to double his side's lead. ​After Getafe went down to ten men following Ivan Alejo's red card, Atletico were able to comfortably see the game out and take all three points back to Madrid. Here is a breakdown of events. Starting XI: Soria (5); Suarez (5), Bruno (6), Cabrera (6), Antunes (7); Portillo (6), Arambarri (6), Dakonam (6), Ndiaye (5); Rodriguez (6), Molina (5). ​Substitutes: Alejo (3), Guardiola (5), Cristoforo (6). ​It's been Simeone's worst start to a ​La Liga season as manager of Atletico and he more than anyone was keen for his side to put in a convincing performance on Saturday, which they duly did. Getafe were a team in form heading into the clash, but Atletico reduced them to very few clear cut chances and controlled the game for large parts. Once they went two goals ahead, they never looked like surrendering the lead and were able to see the game out comfortably to get just their second league win of the season. ​If you were being critical you could argue they should've created more in front of gaol given the attacking talent they have, however Simeone's priority would have been to get a win of any sort so a 2-0 win away from home marks a good days work for his side. Starting XI: Oblak (8); Juanfran (7), Gimenez (7), Hernandez (7), Luis (8); Koke (7), Rodri (7), Saul (6), Lemar (9*); Costa (6), Griezmann (7). ​Substitutes: Partey (6), Godin (6), Correa (6). STAR MAN - After a difficult start to the season, Thomas Lemar had an outstanding game. Despite Atleti's opening goal going down as an own goal, it was made purely by a piece of brilliance by Lemar. His powerful strike from outside the area was just inches from flying into the top corner, however it came crashing off the crossbar and deflected in off the keeper. After being denied of his first goal for his new club in the first half, there was no taking Atleti's second goal from him after Lemar neatly rounded the keeper and tucked the ball home. He proved to be a real threat all over the pitch in a performance which will excite the Atletico fans a lot. And there we go! Thomas Lemar scores and finally it's his! A very, very well worked goal by Atleti who pass out from their own defense. Very, very good! Best game from Thomas Lemar this season as well. Haven't been impressed with him until this game. ​WORST PLAYER - By his standards, ​Diego Costa had a very quiet game. He got very little service from his teammates in the first half and struggled to leave his mark on the match in the second half. He got his first real chance of the game in the 75th minute and it was a golden opportunity, however he struck it straight at the keeper who parried it away with ease. He hasn't scored a La Liga goal so far this season and his drought continues after what was an underwhelming performance from the Spaniard.